I won this residency at VideoBrasil in 2007 for my work Untitled (Zimbabwean Queen of Rave) 2005. I really did not know quite what to expect when I arrived in Rio de Janeiro. I was very excited to be seeing Rio, but I had no idea what I was going to do there. My first few days there were spent on Ilha Grande, which felt more like being on a Survivor show than on an art residency. After getting back to Rio, I started settling in and getting into the swing of things. 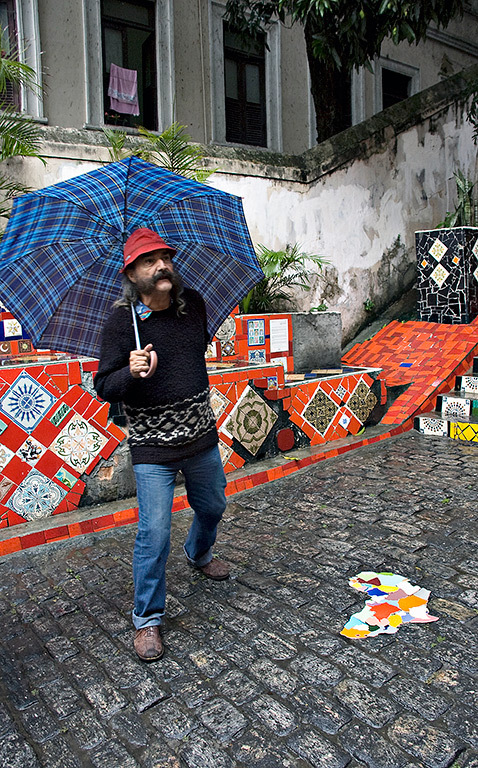 In Rio I was struck by the proliferation of mosaic tiles and patterned cobblestone streets. The beautiful Portuguese tile work formed an integral part of the local landscape. 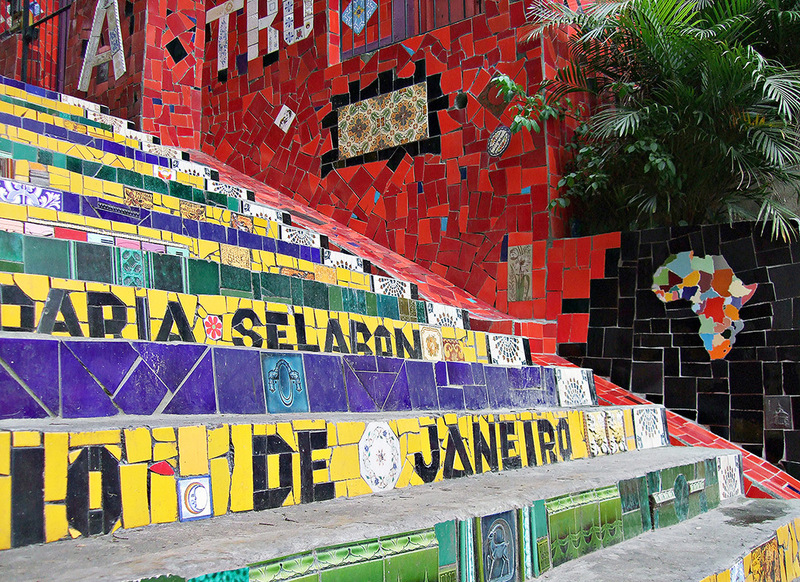 I also discovered a wonderful staircase in Lapa covered in tiles, made by the artist Jorge Selarón. I had seen this landmark before in music video by Snoop Dogg. 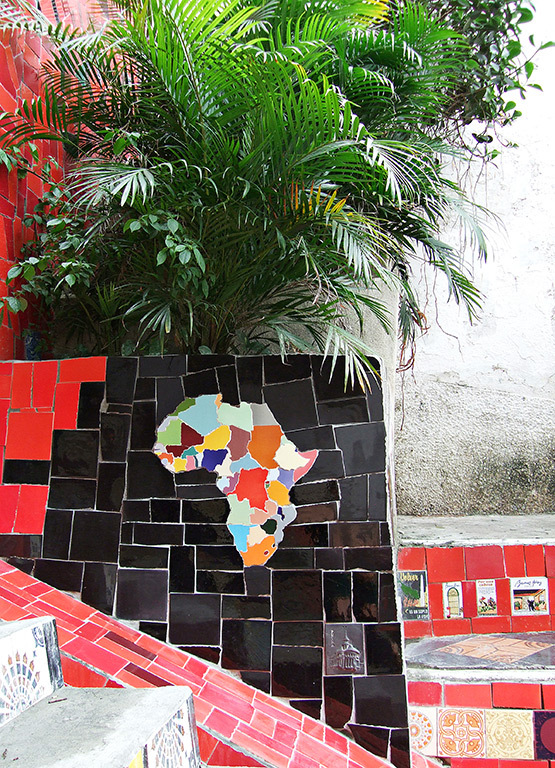 I met with Selarón and he suggested I bring him a tile from Africa to add to the stairs. 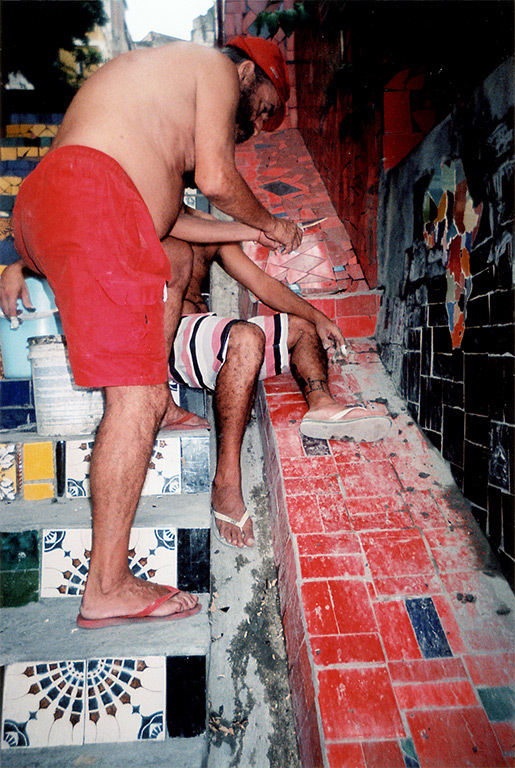 Many of the tiles on the stairs were sent by tourists who have been there. Instead of giving Selarón one tile, I sourced the 50-odd different coloured tiles needed to represent each of the nations in Africa. I had these shaped into the various countries, so they could fit together like puzzle pieces to form the African continent. 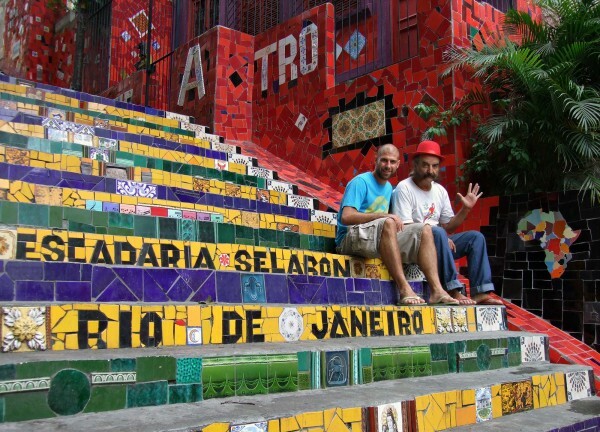 My idea was for Selarón to use these tiles throughout the staircase to fill small empty spaces. An African diaspora of sorts. He preferred to keep the continent together and found a prominent position for the work near the bottom of the stairs. Selarón has since passed away. Under rather suspicious circumstances, his burnt body was found on the staircase. My project was based on a map of Africa, made together with Selarón. Although I have worked with maps before, this was the first time I had worked with the African continent as a whole. Since then I have used the African continent again in other works. This residency produced quite a unique piece. It involved a partial collaboration and a material I had not used before or since. For me, the negotiations involved in making the work were an important interaction. I think my time in Brazil has given me a greater appreciation of my place in the world. Coming originally from Zimbabwe, even here in South Africa I have a sense of displacement, and this certainly impacts on my work. My national identity is somewhat dislocated. 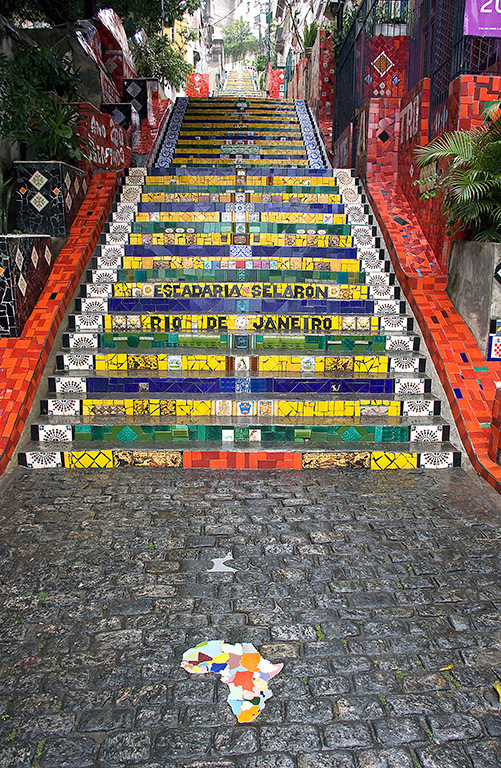 In Brazil, there is a strong feeling of national identity and a common language. I also have a better understanding of the colonial legacy here in Southern Africa as opposed to one in Brazil. I enjoyed the way in which society feels so integrated there, especially along racial and cultural lines, despite a huge wealth disparity.